I know that there are a ton of great keyword tools out there. It seems as though there are new tools for keyword research released every week. Sometimes there are creative ways to use some of the most obvious resources for keyword research. Take Twitter for example. A very popular service used by a lot of people. I should state that we are not suggesting that Twitter is the definitive keyword research tool. We are saying that Twitter can be a creative way of conducting some additional keyword research to help identify phrases that you may have overlooked with your regular research. Remember that keyword research is an iterative process that needs to be ongoing. Your target audience change their semantic map regularly, you should do the same with your keyword baskets. What better way to understand what your audience is saying and which terms they are using than by monitoring social environments that they frequent? Twitter is such a place. Using Twitter Trends - this is the obvious one as Twitter Trends shows the phrases that are currently trending on Twitter. This might be good for e-commerce sites, news site or for advertisers looking to take advabtage of some quick optimization to gain some additional traffic based on trending topics. The trending topics really provides a brief snapshot as to what many on Twitter are discussing and tweeting about. 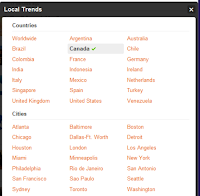 You can actually set the trends to a desired geographic area to see what is trending in various locals around the world. 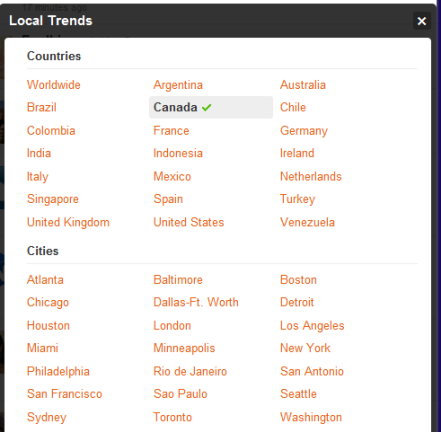 You can select a country or choose a city to see what is trending in that particular area. 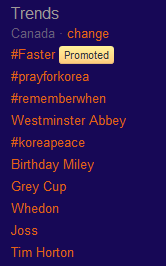 For example if my Trends are set to Canada, I see that today some of the top trending topics include Korea Peace, Tim Horton (the hockey player or perhaps the restaurant) and the Grey Cup (which is Canada's equivalence to the SuperBowl which is taking place this Sunday, Go Riders). Regardless, you can hone in on phrases or topics that are currently popular in Twitter. This can be a great resource to use as part of your keyword research efforts. Reviewing your listed categories - if you have been listed by others in their Twitter lists, you can go in and click on the lists to see the topic and see others who are on the list. For example, if I look at some of the lists that Marketing Jive has been added to, I see terms such as "SEO", "marketing", "Twitter users from Kelowna" etc. While this may not provide a lot of detailed keyword data, you can still identify key topic areas that you may or may not be targeting as part of your keyword strategy. Reviewing the profiles of Twitter accounts of those in your industry - by simply clicking on the profile of other people that you are following in your industry, you can identify topics or terms that you might want to factor into your keyword research. Let' say that I am in the education industry and I want to quickly gain some insight into which keywords that others in my network are using in their profiles, by simply clicking on "Following" from my own profile, I can review any related search terms that others might be using in their profiles. 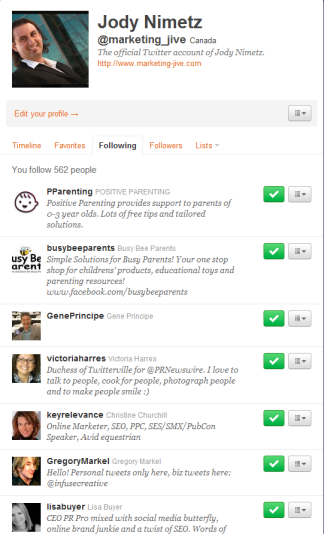 Typically they are sorted by the most recent people that you have followed, so you may have to scroll the list. Reviewing your competitor's profiles and Twitter accounts - similar to the previous item, you can view the profiles of your competitors to see which phrases they are using to describe their business and their Twitter profile. Whether you follow them or not, you can take a quick peek at their profile and compile search terms that you may not have been previously leveraging. Again this is just a quick way to identify some key phrases that are relevant to your industry and to your own business. Twitter is a pretty cool little environment (as much as I hate to admit it), but it can be a great tool to see which topics are trending and what others in your network are discussing (this can be especially important if they are discussing your brand or your business). While you would not want to use Twitter as your sole keyword reasearch tool, Twitter can be a great way to quickly identify keywords that your audience may be using that you are not currently optimizing for or speaking to. Remember everyone has a different semantic map, so the more insight we can gain into the language of our audeince, the better.